The building is situated in Alfred-street, leading from the High-street, and lies nearly in the centre of the University and City. The appearance of the building, now it is complete, with all its appurtenances, is most interesting, and far exceeds anything of the kind in this or any other country. Every portion of it has been carefully adapted to some important purpose: long rows of lofty windows give sufficient ventilation in summer, and, when in cold or damp weather these are closed, their place is efficiently supplied by a ventilating octagonal lantern rising from the dome-shaped centre roof, and fitted with swing sashes so adapted that they can be opened and shut with the greatest facility. A large centre space, open from the ground floor to the dome, allows every spot to be seen from every other, and not only gives accommodation for the apparatus for high climbing and swinging exercises, but affords facilities for the most complete control and supervision. As fencing forms and important part of educational exercise, one half of the upper floor is fitted up as a fencing-school, while the corresponding portion contains modified exercises for young or delicate pupils. The area is entirely devoted to gymnastic exercises on a very extended scale; and, to ensure perfect safety in their practice, the floor is composed of a carefully-constructed padding, soft, thick, and elastic. The physical condition of every pupil, child or adult, on his first entrance to the gymnasium, is carefully examined, and his height and weight, &c., carefully compared with his size, condition, and conformation of body, so that his exercises may be adapted to that part which is defective. Among other machines employed for this purpose is one invented by Mr. McLaren by which he can measure the depth and width of the chest at any point. The building is open daily from nine until four o’clock. Part of this time is devoted to delicate children of both sexes, part to pupils, and the remainder to members – that is, to those pupils who are sufficiently advanced to be able to practise with a less close supervision. Different exercises are, of course, meted out to different pupils in accordance with their age, habits, and physical calibre. Mr. McLaren appears to know what gymnastics truly mean – viz., the education of the body and the apportioning with skilful hand and experienced eye the quality and quantity of the exercises best suited to the special wants of each pupil. Here, too, may be seen that most interesting display — the human frame brought by skilful culture to its perfect attainable point of grace and strength; and in the afternoon, when the more advanced pupils are going through the various feats connected with the jumping horses, horizontal bars, the trapezium, rope ladders, wall-scaling, &c., it presents a scene so animated and striking that few turn from the visitors’ gallery without a feeling of something more than interest in this well-contrived and ably conducted institution. The building has been carried out in a satisfactory manner by Messrs. Castle. The architect of the Oxford Gymnasium, built by Joseph Castle in 1858/9, was William Wilkinson, and its solid, style is very different from his more usual Gothic. It is a rectangular brick building with round-headed windows and doors, surmounted by an octagonal dome and lantern. The building was equipped throughout with the latest gymnastic contrivances, especially a central Norwegian pole 60 feet in height. The client was Archibald McLaren, an early specialist in physical education (see Builder 16 (1858), 716 and 17, (1859), 159. An additional one-storey building, containing a private gymnasium for children, but forming part of the original design, was added in 1861 (Jackson's Oxford Journal, 19 October 1861. This very handsome and well-constructed building, which has been erected for Mr. Maclaren, is now completed, although scarcely four months have elapsed since the foundations were begun. Now that it is fitted up with most of its appurtenances, it appears an useful and interesting building, far exceeding anything of the kind in this or any other country. The size of it is 84 feet in length by 45 feet in breadth. The walls are built of light-coloured bricks, the floors and timbers of the roof are of deal, and the roof is covered with slates. The front and side elevations facing the south have two tiers of semi-circular-headed windows, with deeply recessed heads and reveals, which give the appearance of great solidity to the structure. The lower tiers are divided from the upper by an ornamental splayed and dentilled string-course, and the upper windows are set back in semi-circular arched recesses, giving thereby considerable relief to the elevations. Above these upper arches is a handsome moulded brick cornice, finishing about 33 feet from the ground. The semi-circular arched heads to the windows and recesses are formed with cutting bricks of a colour similar to those in the walls, with pointed-arch outlines, very effective and pleasing. The roof of the building is in three compartments or divisions; the two ends are of a lower pitch than the middle portion, which rises considerably above them. It sprints from a square base, and finished octagonally at the cill of a lantern surmounting it, the top of the lantern being about 60 feet from the ground. There are two entrances to the building – one at the west end, the other at the opposite corner on the south side. The whole area on the ground floor within the walls (besides a small porter’s room, entrance-passage, and dressing room) forms one noble room. The height of this room at each end is 16 feet; the middle portion is open to the roof, and in the centre of this a mast, 60 feet in height, is planted for climbing exercises. There is a staircase leading from the entrance passage to the upper floor, and this floor extends over the whole area of the building, with the exception of the open part in the middle, which is surrounded by a massive hand-rail, supported by handsomely formed newels, and the space between the hand-rail and the floor is filled with wooden trellis-work. Around the sides of this area massive wooden brackets project three feet, between which is extended a species of net-work of half-inch rope, with meshes of proportionate size. The upper floor is formed with iron flitched girders and binders about 14 inches deep, and upon these are laid the joists and flooring. The girders receive support from four ornamental cast-iron columns of twelve inches in diameter. The ceiling underside the floor, also the upper ceiling, are formed into square compartments by the girders and girders, which are left exposed, and, like the rest of the wood-work, are varnished. The building is in every respect a successful one, at once substantial and elegant, and most complete in all its parts. It will be seen that no small amount of care and thought have been bestowed in adapting every portion of it to some important purpose. The long rows of lofty widows will be thrown wide open in summer, and when in cold or wet weather these are closed, the ventilating lantern on the top of the building, with its eight windows swinging on their centres, in connection with eight others at the base of the dome, will afford ample means for the free interchange of pure and vitiated air, far above the heads of the pupils; thus embracing all the advantages of the open air, with none of its disadvantages in this variable climate. The girders and binders, while they give solidity to the floors, and prevent vibration, also afford the most ample facility for the secure attachment of the various machines, and their appearance in the ceiling below is in excellent keeping with the simple and truthful solidity of the general design. The large centre space, open from the ground floor to the dome, thus allowing every spot within the walls to be seen from every other spot, gives the greatest opportunity for complete control and supervision; and the massive hand-rail and solid trellis-work, with the superadded net-work (through which a man may climb, but cannot fall) render accidents impossible. It is being fitted up with exercises suited to pupils of all ages and conditions of health, those which train the body, correct its faults, and advance its powers to their fullest capacity; extending from mere systematized play for very young or delicate children, so arranged that any local weakness or defect may receive the direct and ameliorating effect of the exercise, to those which test and increase the powers of the ablest athletic. As fencing forms and important branch of educational exercise, one half of the upper floor is fitted up as a fencing school. The corresponding portion contains modified exercises for young and delicate pupils. The area is entirely devoted to gymnastic exercises on a very extended scale; and to ensure perfect safety in their practice, the entire floor is composed of a carefully constructed padding, soft, thick, and elastic. 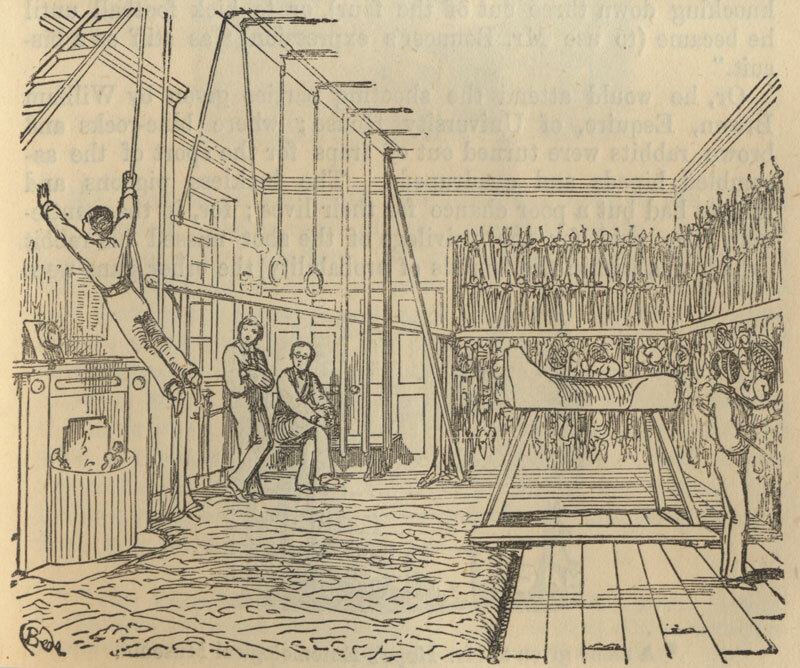 Mr. Maclaren’s long experience and favoured position in Oxford have thus enabled him to erect a Gymnasium, in which the value of bodily exercises, scientifically conducted, may be fully demonstrated, and which we hope before long to see imitated at every public school in the kingdom. Mr. Wilkinson is the architect, and Messrs. Joseph Castle and Co., Cowley Road, the builders. Cuthbert Bede in The Adventures of Mr. Verdant Green, Part III, pp. 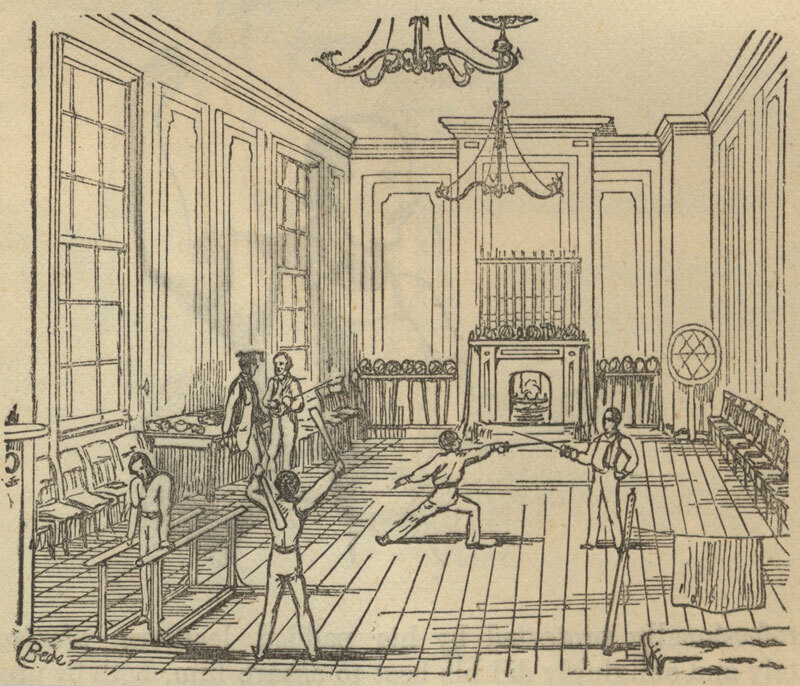 95–7 describes the gymnasium patronized by young Mr Green and includes three drawings: that of Mr Maclaren himself (included in his biography at the end of this page) and those below showing the fencing room and the gymnasium. The three parts of this book were published in 1853, 1854, 1857, so the rooms shown here must be earlier ones occupied by Maclaren, and were obviously not purpose-built..
1927: Gymnasium and boxing display by the Boys' Club Federation. 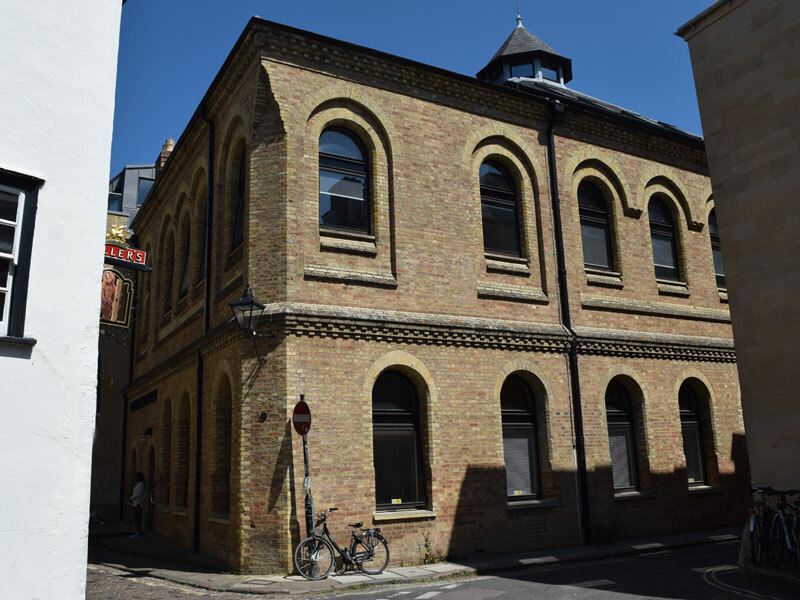 In the 1920s the Holywell Press moved from the octagonal chapel in Catte Street into the gymnasium building, which they occupied until they moved to King's Meadow in 1989. In that year it was converted in to offices and given the name Blue Boar Court. The property management firm Locale moved into these offices in 2017. Archibald Maclaren was born in Edinburgh in 1819, the son of Archibald Maclaren senior. He was educated at Dollar Academy, and then went to continental Europe to study fencing. At the time of the 1841 census Archibald (21) was a fencing master in Oxford, lodging with the victualler Richard Wyatt in the High Street (All Saints parish). On 2 July 1844 at St Andrew's Church in Headington, Archibald Maclaren married Charlotte Wheeler Talboys, the daughter of the radical Oxford printer and bookseller David Alphonso Talboys, who had died in 1840 (see his entry in the Oxford Dictionary of National Biography and in Wikipedia). Both Archibald and Charlotte were living in Headington at the time of their marriage. 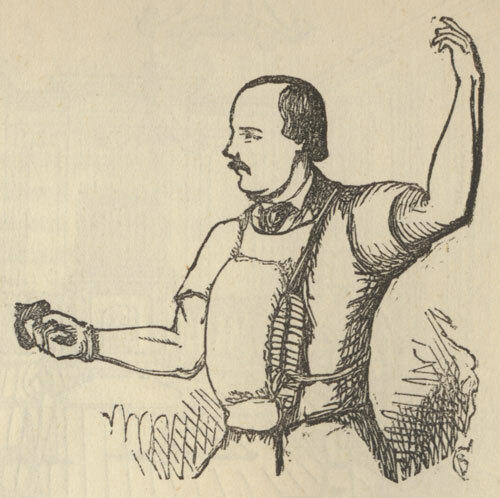 Right: Mr Maclaren, from Cuthbert Bede, The Adventures of Mr Verdant Green, Part III (published in 1857. Less than three months after their marriage, Maclaren's first wife Charlotte died at Headington at the age of 19. Her parents now lived in St Clement's, and she was buried in its churchyard on 4 October 1844. At the time of the 1851 census Archibald Maclaren, a widower of 31 who still described himself as a fencing master, was living in Summertown with his widowed mother-in-law Mary Talboys and three of her children, including Gertrude Isabel Frances Talboys (18). In the third quarter of that year Archibald married Gertrude. The marriage took place discreetly in London, as it was still against the law to married your deceased wife's sister. Their daughter Gertrude Elizabeth was baptised at Summertown on 28 July 1852, followed by Mabel on 20 January 1855, Margaret on 25 December 1859, and John Wallace Hozier Maclaren on 20 October 1861. 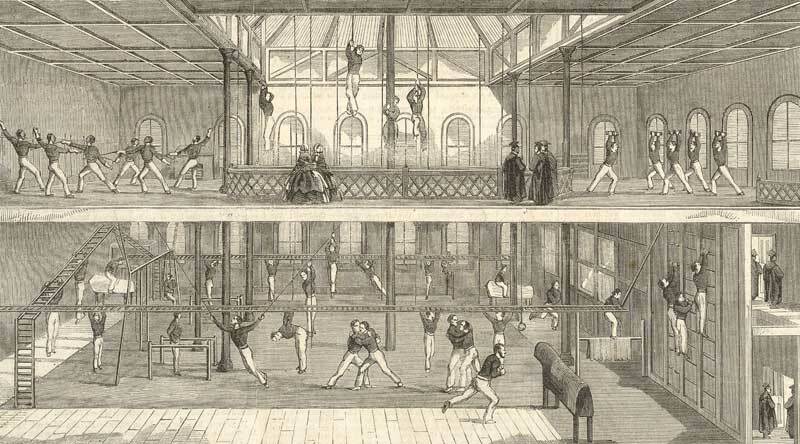 In the 1850s Maclaren equipped rooms in Oxford to teach fencing and gymnastics, and they were so successful that by 1858 he was able to build this gymnasium. The membership of the gym included women and children. In 1857 Maclaran's first book, The Fairy Family. A Series of Ballads & Metrical Tales was published, illustrated by an Oxford undergraduate, Edward Burne-Jones, who was later to become a famous artist. He and William Morris practised singlestick, boxing, and fencing in Maclaren's gymnasium, and were often invited to his home in Summertown. In January 1859 Maclaren organized a celebration in Oxford marking Burns' centenary. In 1860 Maclaren trained twelve sergeants who then implemented his training regimen for the British army. At the time of the 1861 census Archibald Maclaren (41), who now described himself as the proprietor of a gymnasium, was living at Banbury Road Villa with his wife Gertrude (28) and their daughter Mabel (6). In 1863 Maclaren constructed a new gymnasium at Chatham for the Government. In 1864 Archibald Maclaren and his second wife Gertrude opened a school in Oxford, Summerfield House School (today known as Summer Fields), which he gave the appropriate motto Mens sana in corpore sano. In 1869 the Clarendon Press published Maclaren's book A System of Physical Education, Theoretical and Practical (details here). In 1871 Archibald was living at Summerfield House School, with his wife Gertrude and their children Mabel (16), Margaret (11), and John (9), plus three servants and 39 boy boarders aged between 9 and 14. He and his wife were still living at the school in 1881 with their daughter Margaret. Archibald died at the school three years later after a lingering illness at the age of 65 on 19 February 1884 and was buried at Summertown on 22 February. His personal estate came to £13,649 4s. 6d. His second wife Gertrude was buried with him in 1896.